As Acme is segmented into a number of different service groups, each manager needed to send emails from various aliases. This was causing issues as emails were often sent from the wrong addresses, confusing customers and making the brand look amateurish. Exclaimer Email Alias Manager for Exchange allowed each manager to maintain a single Exchange mailbox that would let them send from multiple email addresses according to the needs of the organization. Founded in 1964, The Acme Facilities Group is a leading supplier of commercial refrigeration, catering equipment and air conditioning units across the United Kingdom. Employing over 150 people, the organization services a diverse client portfolio ranging from pub groups, local councils, schools, hospitals and construction companies. Its staff also includes a team of in-house designers who are dedicated to designing commercial kitchens and serveries using the latest AutoCAD technology. With three office locations and a 50,000 sq. ft. warehouse based in Blackburn, Acme continues to go from strength to strength in what is its 50th year. It continues to provide a first class and award- winning service which makes it stand out from other competitors on the market. For as long as Exchange administrators can remember, it has been difficult to let users send email from more than one email address. A request of this nature will often lead to IT departments deploying workarounds such as setting up different POP3 accounts or training users to work in a way that does not come naturally to them. This was a common issue at Acme. Due to the number of business services that the organization offers, the various office locations and the fact that it also trades as H&H Refrigeration Ltd, the management staff were having to use numerous email accounts, each of which they had to manage individually. This had proved to be an inadequate way of working as there were too many occurrences where emails would accidentally be sent from the wrong address which was, at best, an embarrassment and, at worst, damaging to the Acme brand. Simply put, something was required to mitigate these risks and provide management with a way to easily control all of their email aliases. I have been using Exclaimer products for a number of years and always recommend them to anyone I speak to. Once the software was installed and deployed, its value quickly became apparent. 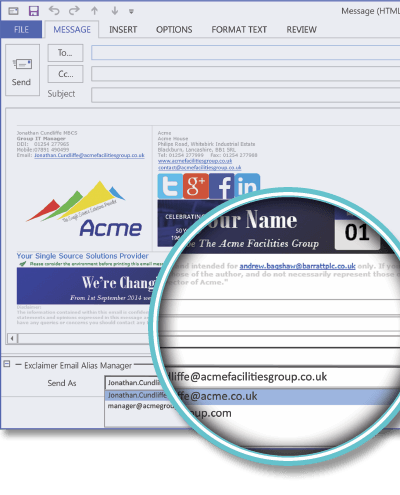 “Using Email Alias Manager for Exchange meant that managers no longer had to jump between mailboxes, which had overcomplicated their workload in the past and taken up so much of their time,” declared Mr Cundliffe as he described the immediate benefits that the software brought to Acme. For new emails, a manager simply had to select the alias from the dropdown menu in their Outlook client, while all replies would have the alias automatically selected according to who they had sent their original email to. The software also integrated perfectly with Signature Manager Outlook Edition, so any outgoing email would have the appropriate corporate branding, contact information and the correct email address. With the implementation of Email Alias Manager for Exchange, there has been an immediate effect on productivity, with managers no longer needing to navigate between numerous mailboxes. With the software’s simple Outlook drop-down list, the likelihood of emails being sent from the wrong address has become practically non-existent, minimizing any risk to the brand’s identity. For managers who are off site and away from a main office location, they can easily choose their email alias via a mobile device like a smartphone or tablet.